17 Jan Gallop into battle with Bass Eddie! New Legacy of the Beast Sacrifice event on now! Bass Eddie + 4 new Banshees! The second part of the Night City Mega Event has just begun! Shrieking Souls can also be purchased for Ironite in packs of 1, 3 or 10. The Shrieking Soul is a limited time event soul which guarantees a 3★ to 5★ character of any class. It also gives an increased chance of receiving Bass Eddie, and the Magus and Sentinel Banshee, as well as an EXCLUSIVE chance at earning the Gunner and Assassin Banshee. 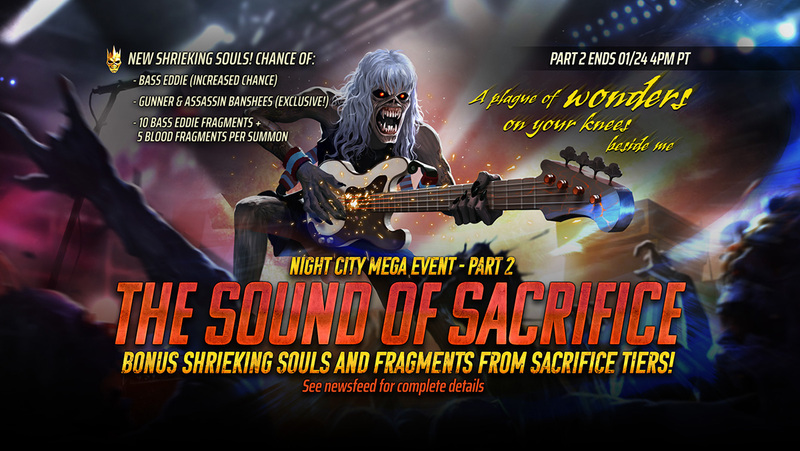 Each Shrieking Soul summoned will also grant bonus rewards of 10 Bass Eddie Fragments, and 5 Blood Fragments. Collecting 750 Bass Eddie Soul Fragments guarantees Bass Eddie! Banshee ( 4★ Assassin) – A hybrid damage reviver that grants her allies a chance to avoid all damage when hit. Banshee (4★ Gunner) – A powerful negative effect caster capable of removing beneficial effects from opponents that deal damage to her and inflicting devastating negative effects on the enemy team, while buffing her allies. The Assassin and Gunner Banshee are ONLY available in the Shrieking Soul. While these characters will occasionally be featured in Heroic Soul Rotations, they will NOT be added to any other Souls, making the Shrieking Soul your best shot at securing them. Bass Eddie (5★ Magus) – A team enhancer that removes a beneficial and golden effect from the enemy with every action and grants Perfect Accuracy Up to his allies, increasing their chance of landing effects by +50%, and Perfect Accuracy down to enemies, reducing their chance of triggering effects by 90%! Banshee (4★ Sentinel) – A self-reviving, party healer that can grant Defense and MR Charged positive effects to her team, while removing shields and dealing enemy Max HP damage. Banshee (4★ Magus) – A high damage ability disabler that can inflict a new negative effect called “Stop”, which prevents the enemy from gaining extra turns! These 3 characters are also earnable from all other souls that can drop a character of their specific rarity and class. SPECIAL EVENT ADDITION: For the duration of the event, there are also new event challenges based around Sacrifice. Meet the requirements to earn Final Frontier Eddie Fragments, Epic Souls, Frontier Coins and more!